The interfacial behavior of ionic dyes at the polarized liquid/liquid interface is studied by spectroelectrochemical techniques. By analyzing the appropriate optical signal instead of the overall current responses, the interfacial behavior of the target dye species could be studied in the absence of the interference with non-chromophoric species. A lock-in detection of ac-modulated optical signals under the potential-modulation superimposed on a linear potential sweep improves the sensitivity and the selectivity to the interfacial phenomena of dye species. Potential-modulated fluorescence (PMF) spectroscopy has been applied for the ion-transfer reaction across the liquid/liquid interface. The high sensitivity of PMF spectroscopy to interfacial phenomena, especially adsorption, has allowed us to investigate the various fluorescent species, such as porphyrin, xanthene, and pyrene derivatives. The combination of PMF spectroscopy and conventional electrochemical techniques could uncover the interfacial adsorption and transfer mechanisms. In a heterogeneous photoinduced electron transfer reaction between hydrophilic dyes and lipophilic quenchers across a liquid/liquid interface, the hydrophile-lipophile intermediate ion pair can be formed only in the interfacial region. The product-separation process of the intermediate takes place effectively at the interface. Recently, we have demonstrated that a photocurrent arising from the photoreduction of metalloporphyrin is significantly enhanced in the presence of gold nanoparticles (Au-NPs). The photocurrent enhancement is dependent on the concentration of Au-NPs, the excitation wavelength, and the polarization angle of the excitation light, respectively. 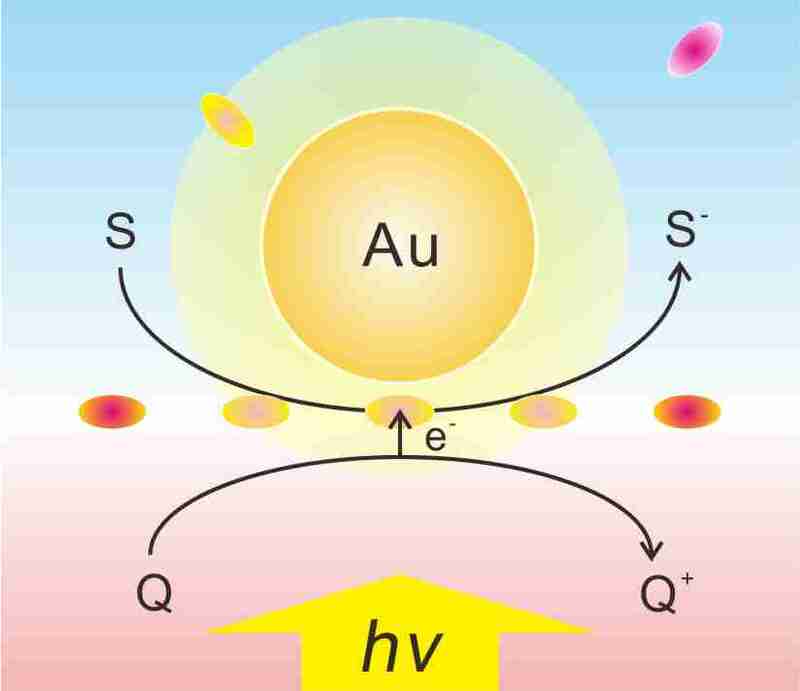 The photocurrent enhancements could be correlated with Au-NPs acting as sensitizers involving the localized surface plasmon (LSP) effect to improve the photoreaction yield. We further investigate the photoreactivity of metal nanoparticles, e.g. Au-NPs, gold core-silver shell nanoparticles etc., electrochemically adsorbed at the liquid/liquid interface. The physico-chemical properties of the monolayer containing metalloporphyrins formed at the air/water interface have been studied due to their crucial roles in the construction of functional thin layer materials, e.g., Langmuir-Blodgett film and self-assemble monolayer. The structural characterizations at molecular level such as a coordination structure of metal ion have, however, rarely been carried out during their formation processes at the air-water interface since the lack of a suitable technique. 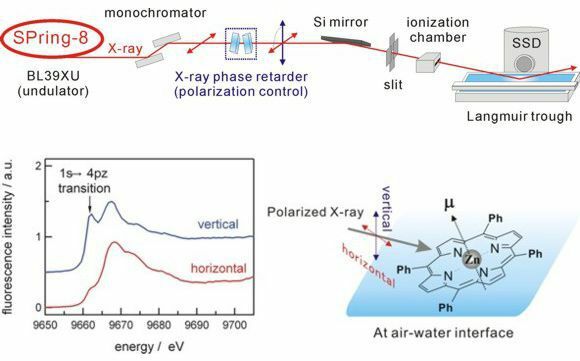 Total-reflection X-ray absorption fine structure (TR-XAFS) technique allows us to investigate the solvation and coordination structures of ions at the air-water interface. The molecular orientation and solvation structure of metalloporphyrins at the air/water interface could successfully be analyzed by the polarization dependence of the XAFS spectrum. The results demonstrated that the axial-coordination structure of metal complexes at the air-water interface is modified from the bulk solution species. We further develop the TR-XAFS method for the liquid-liquid interface.